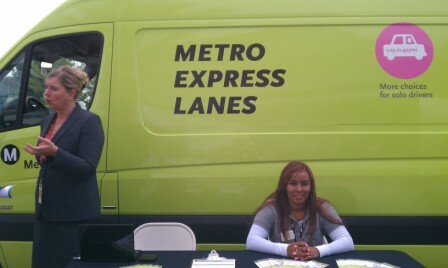 Mel the ExpressLanes van at El Monte Station opening yesterday. Metro just released this schedule for Mel, the ExpressLanes van that’s traveling the countryside, signing up commuters for transponders before the Nov. 10 deadline. Mel, a specially equipped van painted bright green to serve as a visible outreach program, is traveling around the region to bring FasTrak® accounts and transponders to commuters so they will be ready to use the Metro ExpressLanes when the lanes open on the 110 Harbor Freeway on Nov. 10 and on the 10 San Bernardino Freeway early next year. Metro ExpressLanes is a one-year demonstration project to reduce traffic congestion along 11 miles of the 110 (between Adams Boulevard and the 91 freeway) and 14 miles of the 10 (between Alameda Street and the 605) by turning the HOV (High Occupancy Vehicle) lanes into HOT (High Occupancy Toll) lanes that allow solo drivers to use the carpool lanes by paying a toll. For now, the carpool lanes are still operating. But when tolling begins Nov. 10 on the 110 ExpressLanes and early next year on the 10 Expresslanes, all drivers will need a FasTrak® account and transponder to travel in the ExpressLanes. Carpools, vanpools, motorcycles and buses will continue to travel for free in the lanes. Solo drivers will be assessed a toll, which will vary depending on traffic. To avoid traffic back-ups, sensors will be used to measure congestion in the Metro ExpressLanes and will increase the toll from 25 cents a mile to a maximum of $1.40 a mile as more vehicles enter the Metro ExpressLanes. Net toll revenues will be reinvested in transit and carpool lane improvements in the corridor where generated. The costs vary depending on payment methods, but drivers who open their accounts with a credit or debit card will pay $40 and the transponder deposit will be waived. The $40 will be applied to any tolls on the Metro ExpressLanes. There is a minimum balance threshold of $10, and a $3 monthly account fee. The monthly fee is waived after four one-way trips in the Metro ExpressLanes and/or on transit in the ExpressLanes corridor. Discounts are available. Commuters who open a FasTrak® account by Oct. 16 will qualify for $5 in free tolls and be entered into a drawing for an iPhone 5. Members of the Automobile Club of Southern California (AAA) can open a Metro ExpressLanes FasTrak® account at a discounted price of $32 (an $8 savings) by visiting their local AAA branch office or online at www.AAA.com/metroexpresslanes. In a first for an ExpressLanes project, low-income commuters can receive a $25 toll credit when setting up an account, and the transponder deposit will be waived. To qualify, the commuters must reside inLos AngelesCountyand have an annual income below $37,061 for a family of three. There is a limit of one equity plan per household. To schedule a visit by Mel to a public event or workplace, please contact Allison J. Richards, 213-922-7468 or email her at RichardsA@metro.net. Awesome story… I wish the State would build an HOV or Toll lane on Santa Monica Freeway and Golden State Freeway North and South or take a lane away for HOV or Toll. Either way, riding my scooter I get all the benefits! How do transponders limit ‘cheating’ on the HOT lanes? I ask because if the enforcement focus is on cars without transponders, than people with transponders can switch it to carpool and avoid charges with little fear of reprisal. Whereas those without transponders will be sanctioned even though they may be carpooling and not subject to toll fees anyway.